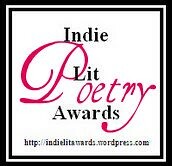 As many of you already know, I’ve been working with the Indie Lit Awards for 2011 on as director of the Poetry panel. This was the first year for an award in the poetry category, and I think the team picked the right two collections for the winner and runner-up slots. Laurie Soriano for Catalina (also available for Kindle), which was published by Lummox Press. Please check out these videos of her reading from the collection. Stay tuned to the Indie Lit Awards for our interview with Laurie. The runner up in the poetry category was Edward Nudelman‘s collection, What Looks Like an Elephant, also from Lummox Press. For the list of Fiction, Bio/Memoir, GLBTQ, Mystery, Nonfiction, and Speculative Fiction, please click on the Indie Lit Awards button in this post. Congrats to all the winners, including Aine Greaney for Dance Lessons, which I reviewed here and who offered a look at her writing process after the novel is published, in the fiction category. Yesterday, I reviewed Áine Greaney‘s Dance Lessons, which is a phenomenal story about the secrets families keep and how forgiveness can transcend the grave. Part mystery and part romance and family drama, the story follows Ellen Boisvert as she uncovers her husband’s past. Today, Áine Greaney has graciously offered to talk about her writing space and the time between a finished novel and the next one or the next project. My second novel, DANCE LESSONS, took me seven years to write. During the early years, I worked on that book in spurts. There were entire weeks and months when I abandoned it altogether, when I let the book’s women characters slip from my mind. Jo? Jo who? Interruptions, they say, are not what distract us from life. They are life. During my seven-year book process, there were urgent trips back to my family in Ireland. There was a day job to go to. There was a house move. There were other deadlines to meet. Eventually, in fits and starts, I whipped and whittled that book into shape. The gym woman was right. I was thinking about 14-year-old Cat and her hip-hop dance lessons. Last April, 2011, I stood in my local Indie bookstore with almost 140 people (I have good friends) at my book’s launch party. For the next month, I read about my book and myself in blog posts and articles. At a fundraiser dinner one night, a woman crossed the room to tell me why she personally had it in for Jo, my Mommy Dearest old-lady character. And then? The summer of quiet. It’s been four months since the release of my novel. During the four months, the national bestseller lists have changed, then changed again (and again). The titles and rankings have flipped and clacked like that T.V. advertisement for the price slashers at Wal-Mart. In maternity wards across America, new babies have been born. In chapels and homes and hospice facilities, people have bade a final goodbye to people they loved. In other words, the world doesn’t stop or change because you write a novel. A month after the release of DANCE LESSONS, an inner voice urged me to get off the poseur podium and get to work on the (gulp!) next writing project. 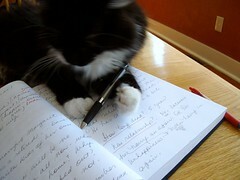 So I’ve started two new projects: a third novel; and a fledgling creative non-fiction (a memoir?) book. Thing is, I find myself working on both of my new projects in scattered, hand-written drafts. I oscillate between loving my new ideas and hating them. They both terrify me, especially the non-fiction project. But it’s not time. Not yet. 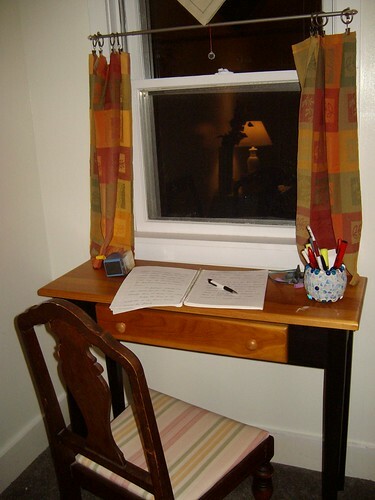 Thanks, Áine, for sharing with us your writing space and the time of refocus following that published novel. I love that she writes her novels in long hand, or at least her notes, and that red wall I spy is my favorite! Dance Lessons by Áine Greaney is about the dance we play with our husbands, wives, in-laws, and our own parents as we strive to keep things amicable and not reveal too many of our own secrets, especially secrets we’re not comfortable with ourselves. Sometimes, it is about the dance the characters play with themselves, balancing the truth and the lies. Set in Boston, the North Shore, and mostly Gowna, Ireland, Greaney’s prose sways like a graceful dancer telling Ellen Boisvert’s (a young lecturer at Coventry Academy) story. She learns that her Irish husband, Fintan, was not an orphan as he had told her, but has a mother still in Ireland, and there are many other secrets he never revealed to her while alive. Despite Ellen’s desire to leave her husband, she stayed with him for more than a decade and never left him before he died in a tragic sailing accident. Upon learning that she has a mother-in-law, she writes a letter to inform Jo Dowd of her son’s death. After an eerie conversation with the woman and several ghostly dreams, Ellen decides to travel to Ireland. Each step and each movement is part of a larger story, a larger existence. Fintan’s life and decisions had more of an impact on those around him than he realized, from his mother to his one-time girlfriend and his current wife, Ellen. Greaney’s story is not one just of grief, but of moving on, stepping out into the light and claiming one’s life back. In death, there is a renewal, a new beginning, but people have to be willing to reach out and grab it. Ellen, like Jo, has lived in the shadow of her sister, but unlike Jo, she is given the chance to excel to take a hold of the reins and steer her own destiny. Greaney’s story is heartbreaking, heart warming, and as turbulent as the weather of Ireland and the human heart. Readers also get a taste of the Irish hierarchy and the depressed economic times of the 1950s, and the influx of foreigners. From jealousy and rage to pity and understanding, the range of emotions in Dance Lessons are reminiscent of the ballet and operatic pieces of some of classical’s greatest artists. Born and raised in County Mayo, Áine Greaney is a writer and editor living on Boston’s North Shore. She is the author of the novel The Big House and the short story collection The Sheep Breeders Dance. In addition, she has written several award-winning short stories and numerous feature articles for the Irish Independent, the Irish Voice, Creative Nonfiction, and the Literary Review, among others. 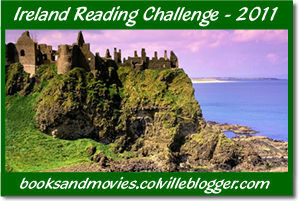 This is my 2nd book for the Ireland Reading Challenge. This is my 50th book for the 2011 New Authors Reading Challenge.